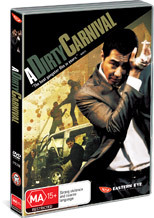 Gritty and compelling, A Dirty Carnival shows off the strengths of South Korean director Ha Yu with his ability to get the most out of his actors and force a realism that allows us to identify to identify with the characters and the internal anguish they face whilst committing acts that they may not agree with. I liked this movie for a number of reasons, primarily the engrossing storyline, but also the way the film has been treated in what I would suggest to be a noir fashion. The look overall is gritty and the lighting superb in an almost art house fashion of sorts. Starring Jo In-seong as Byung-doo, we see a young man who is forced to take over the welfare of the family and as a result gets entrenched within the Korean crime world when he offers to kill a corrupt court prosecutor on the behalf of a President of one of the crime families in order to win his trust within their secretive ranks. This is a fairly brutal movie that fully deserves it's rating. There is a realism to the violence that makes it believable and sometimes sickening. There is nothing glamorous about these acts and they are often carrying out with a blunt deliberateness that makes you wince with each blow. Our criminals are indeed just that; criminals who are very focused on their work and achieving results. Gone are the buffoons who are there for comedy value only from other movies or who have quirky humorous personalities. Crime in this movie is a deadly business indeed. A Dirty Carnival is an adventure in storytelling craft. The script is very polished and certainly not overdone. It gives you the feeling of being there but at the same time wishing you were somewhere else, like the car crash where you should look away but can't. The release by Madman is a tad on the light side when it comes to extras featuring a theatrical trailer and a stills gallery. As much as I would have liked to have seen more, the feature itself is more than enough reason to pick it up.